The lads in Wodonga have been hiding an interesting play area. 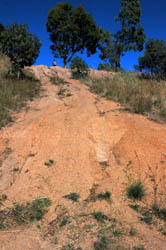 The sides of Lake Hume have tracks from easy (some cars can drive them) to difficult. Had to walk some as a fully loaded Prado wasn\'t going to make it up. There are miles and miles of tracks going around the dam water line which will hold interest for beginners to some extreme. Camping, boating and fishing are some of the other things you can get up too.